Choosing a life of dignity and devotion over a life of money and misery. I was born in December 1962 to a well-to-do Gujarati family in Mumbai. My father, a wealthy businessman, was deeply religious; two of India’s most popular gurus were the spiritual guides of our family. As a child, I was an object of their affection, and due to a spiritual atmosphere at home, I was attracted to hearing and chanting Krishna’s holy names and pastimes. I also excelled in my studies. In 1981 I stood first among 300,000 students appearing for the sales-management exam conducted by the London Chamber of Commerce. The Bombay Chamber of Commerce honored me for being the first Indian in a hundred years and the youngest in the world as a nineteen-year-old to bag this prestigious gold medal. After securing seven post-graduate management degrees by 1985, I was all set to take over my father’s business. Meanwhile, as my own stock-market career flourished, I underwent an unforgettable experience. In 1989 my M.B.A classmate and friend Dilip Upponi took me to an ISKCON temple in South Mumbai to hear a discourse by His Holiness Radhanatha Swami, who described Vrndavana and Krishna’s pastimes in great detail. His class fanned the spark of attraction for Krishna I already had in my heart. I began to attend the temple classes more frequently. Dilip then gave me books written by Srila Prabhupada, the founder of ISKCON. These books had a mesmerizing effect on me. I was stunned to read in Srila Prabhupada’s books that the highest expression of religion is when a devotee approaches God without any desire except to serve and please Him. 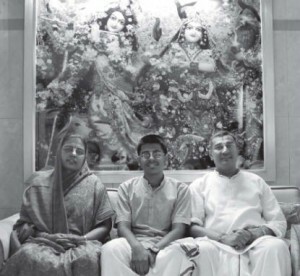 I was also attached to my father’s two gurus and wondered if I was being disloyal to them by coming to ISKCON. My heart pulled me closer to Srila Prabhupada and his sincere followers, who were teaching essentially the same things my parents and family gurus had been teaching. Yet I found them urging me to take my devotional service a step higher to offer my whole existence to God without expecting anything in return. Deciding to commit to the path of Krishna consciousness, I took spiritual initiation and received the name Ananda Vrndavana Dasa, while my friend Dilip became Devamrta Dasa. However, my innocent hopes of living a happy life centered on Krishna and devotees was soon to be challenged. Since Radhanatha Swami was born in America, my conservative, orthodox father was outraged at my decision to accept initiation from someone who wasn’t born in India and was from another race. He wanted me to take initiation from one of his gurus. I assured my father I would continue to serve them. But he insisted I reject the American guru and accept an Indian guru. While everyone protested and discouraged me from attending ISKCON programs, I became firmer in my resolve to pursue my inner calling. Exasperated, my father issued an ultimatum: If I didn’t give up associating with ISKCON, I would be deprived of our family fortune. In my youthful frenzy, I responded to the threat by claiming I didn’t want any of his wealth. I sensed that if my father were to kick me out of our home, my life would be difficult. But I was determined to pursue Krishna consciousness. My father was unrelenting, and I didn’t budge either. One evening, after yet another confrontation, I left home and angrily vowed never to return. I sought to one day prove to him that I could amass a lot of wealth on my own. The devotees at Mumbai ISKCON encouraged me to stay at the temple rather than live alone. The love and care I received from the devotees at the temple, the power of pure Krishna conscious philosophy, and the joy I felt in hearing and chanting Krishna’s names helped me take the bold steps to leave home. I bought a small house in the suburbs of Mumbai and married a devout girl from the temple congregation. As my father had removed my name from the family inheritance, I felt a need to earn more money. A friend and former business partner of mine proposed a scheme that would make us millionaires overnight. The offer had legal discrepancies, however, and could lead to complications later. My friend dismissed my apprehension and assured me it was a foolproof plan. With our combined financial know-how we could take this enterprise to new heights. The temptation was difficult to resist; I could now prove to my father that I could be wealthier than he was, and didn’t need any of his goodwill or inheritance. I also thought I could use my increased wealth to serve Krishna and His devotees. The temple needed funds. I was all set to join the business, but first I needed to ask my friend Devamrta Dasa. He patiently heard my story but didn’t share my enthusiasm. I was caught in the sea of confusion. On the one hand, the wave of my partner’s attractive offer pulled me. I could make it big and once and for all silence all my critics, including my father. On the other hand, a devotee of Krishna was asking me to refrain. After weeks of being tossed by conflicting thoughts and feelings, I finally made the painful decision: I withdrew from the plan. My partner expressed shock at my “foolishness.” But I was now firm in my choice to live by the wisdom of Krishna’s devotees. A year later my erstwhile partner invited me to a business conference in a leading five-star hotel. By now he was a multi-millionaire and a business star, adored by the media. As cameras flashed and reporters interviewed him, I stood in a corner and watched his quick ascension to the hall of fame and success. At the end of the conference he called me over and rebuked me. I heard him patiently but wasn’t tempted. I was now deeply attached to devotees and the Krishna conscious way of life. My earnings were sufficient to keep our family content. My wife, Tulasi Devi Dasi, and son, Raghunatha, supported my Krishna conscious values and spiritual practices and abhorred the greed-impelled pursuit of wealth. I left the meeting unruffled, yet disappointed at my inability to convince my friend to abandon his dangerous ways. A few days later, yet another reality hit me. The headlines of all the national newspapers and television channels carried the story of one of the three biggest financial scams India had ever witnessed. My former friend was exposed in a fifty-billion-rupee fraud, and his photograph flashed all over. He was now in jail, condemned by the media, government, and police, and charged with over a hundred serious financial crimes. As I followed the news carefully, I realized how Krishna consciousness and the association of devotees had saved me. Had it not been for my devotee friend Devamrta Dasa, I too would be languishing in prison today. Krishna had saved me by sending me His loving devotees as my friends and saviors. Over the last two decades of practicing Krishna consciousness and seeing the swinging fortunes of the volatile financial markets, I have learned valuable lessons in spiritual life. Strong hearing and chanting have sustained me over the last two decades. I have vowed to never enter the stock market without first completing my sixteen rounds of chanting Hare Krishna on my prayer beads. I also first hear one spiritual lecture on my iPod or at the temple, and only then do I enter my business arena. These practices have given me the strength from within to resist temptations and make the right decisions. Another lesson I’ve learned is the value of the association of saintly devotees. I have observed that devotees in the renounced order are blissful even without having money. In stark contrast, I saw people in the stock market earning up to 200,000 rupees daily, yet they were miserable and needed to take sleeping pills. This convinced me that money is not the source of happiness. This realization also helped me say no to the tempting offers of some business entrepreneurs who wanted to share fifty per cent of their profits with me if I would offer them advice on daily stock trading. They even assured me they would bear any losses, while I only needed to offer my intuitive stock-market sense to help them. I’ve rejected these offers because they are open gambling and injurious to my spiritual health. My realizations can be summed up in one sentence: Life is a struggle, but it is a happy struggle if we can remember Krishna and be attached to hearing and chanting His holy names in the association of His loving devotees.